Rachel is a Licensed Professional Counselor. She earned a BA degree from the University of Minnesota and a MC degree from Arizona State University. 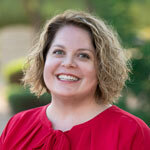 With experience in both private practice and hospital settings, she works with children, teens, adults, and couples. She spent time at Banner Desert Medical Center working with oncology patients and their families in various stages of the disease. She has experience in treating depression, anxiety, bipolar disorder, grief, crisis, and trauma. She has additional experience with adoptive parents, biological parents, and adopted children. As a professional, she strives to help her clients find peace, balance, and an increased understanding of their emotions and behaviors within a safe environment. In her free time, she enjoys spending time with family. Be the first to review one of our therapists or office staff. We appreciate your feedback.